I went out as the sun was setting last evening. Got some of the weeping cherry blossoms in this shot. The tree is leafing now, the blooms are short lived. I just love how delicate they are. The sun is going down behind a cloud in the horizon. In a matter of just a few moments the skies change in colors. This is the woods across the road from our house. Looking toward town. Our courthouse clock tower can be seen through the gap between the trees. When we first moved here, if I could not have seen that I do not know if I could have stayed here. I cried for a month after moving. I still miss living in town. The sun has made it's exit for Wednesday here in Tipton. Yesterday was a truly beautiful day. I started it by going for a blood draw at the hospital. The lab girl took seven vials of blood. I thought I would need a transfusion afterwards. LOL. My doctor wanted a full work up. Hope that all comes back good. All this to adjust my cholesterol medicine. I went through our park yesterday. Stopped and got some photos. I am so proud of the way our park looks. So clean. I see now that the brambles have been removed from the creek's edge. You can see we have had a lot of rain, the creeks up. 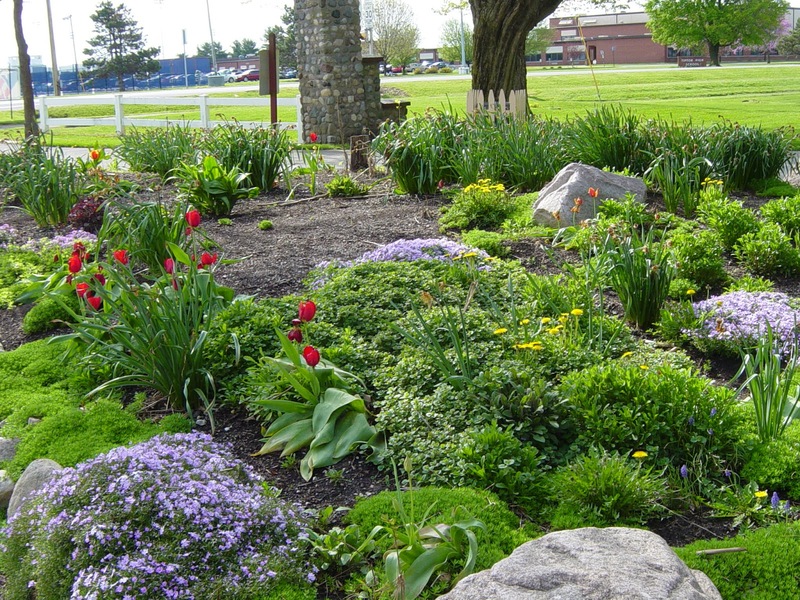 This is the walking path along the creek, it goes to the nursing home and hospital, that are near the park. It will take you to 4-H road to our fair grounds. Our golf course is across the creek from our park. I had to get a picture of this new water fountain near the toddlers playground. The toddler's playground has a fence around it., so moms can relax a bit.Has a swing for mommies to sit on. The equipment in the background of this photo is sitting in about a foot of mulch...protection for falling kids . 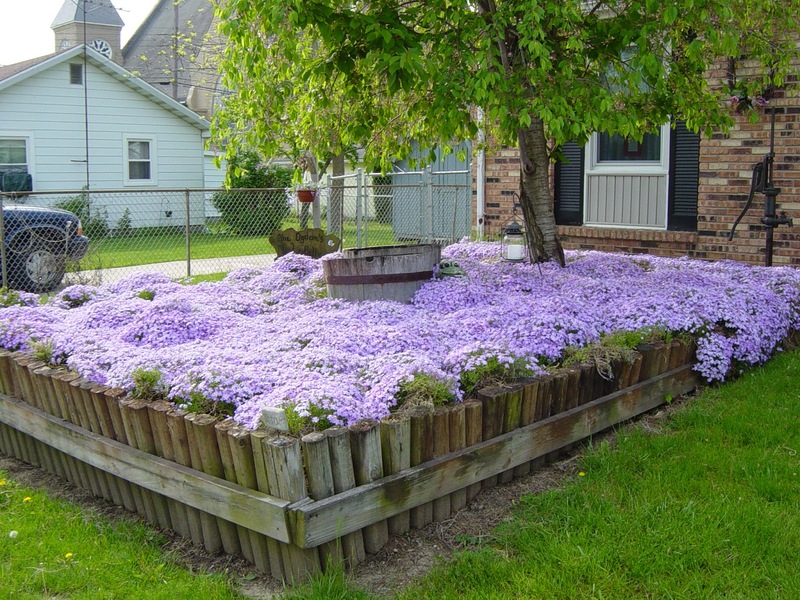 I am going to go to town and look to see if this yard has it's huge garden of phlox. This is last year's picture. This is the most phlox I have seen , other than on a hillside once. This is the entrance to our city park. The Goose Bean Garden Club ladies tend to the flowerbeds there. I think they do a fine job. Their club will also be having a plant sale in front of our library soon. I am hoping to buy some fern plants this year. This month of April is about over . It seems the farmers are late getting into their fields...that's because of all the rain we have had. Apple blossoms on the neighbor's trees. Sorry this is blurring. 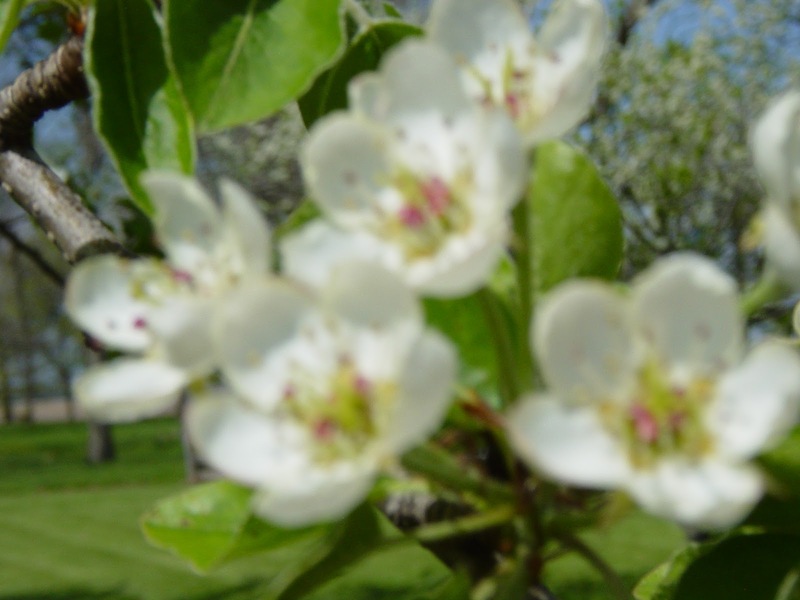 I love apple blossoms. Well my goodness, I think I am becoming more and more like my mother. Do any of you find yourself becoming like your moms? :) My mom loved every flowering tree she saw. 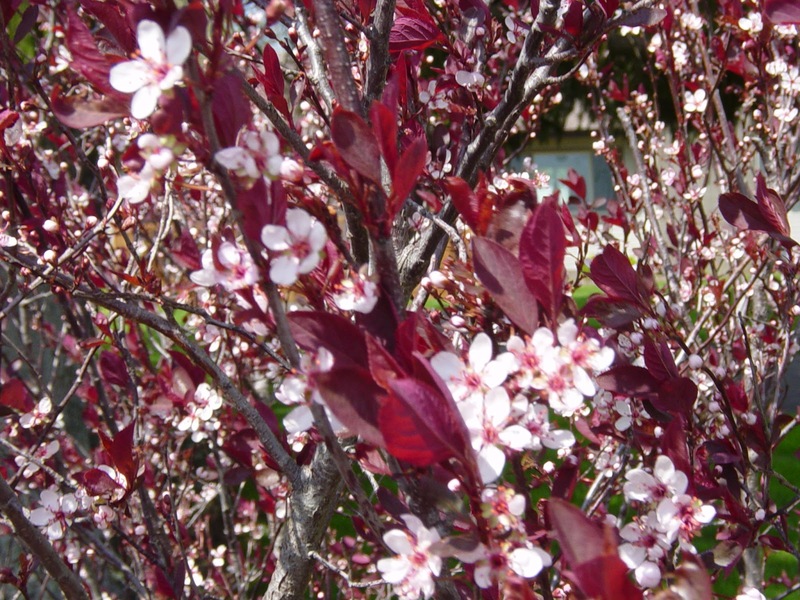 This is our flowering plum bush. I love the burgundy leaves and delicate pink flowers. I do not find a lot of fragrance in this flower. I like having bright limey greens, dark greens, and burgundy colors throughout our yard. So when there is no flowers, you can still have color. Thank you dear friends , for all the prayers for Ted's brother Ray. He will be getting a new biopsy on Monday. We have been visiting him at the hospital. He looked better last evening, I think because he had finally had some rest. He said the pain has kept him restless and unable to sleep. Wednesday evening it was a nice time. It has been cold around here lately. Friday morning, the sun was very bright and things look so green. The Japanese maple is leafing out. This is the front yard this rainy Saturday morning. I must say our lawn is looking very thick and full. You can see it's a bit hazy out too. This week on BJ's blog she showed how she uses flowers that are real and faux. So I put the pink tulips I got from hobby-lobby in a basket of greenery. My tablecloth has tulips on it also. This will work for a couple of weeks. Today , I need to ask all of you, my blog family and friends, for prayers and good wishes please. Ted's brother has been going through many tests at the local VA hospital. The tests show that Ray has mesothelioma. It has spread to his bones. He will be seeing an oncologist this weekend . It is stage 4. I had to get on line to understand how Ray could not have know he was this ill. It was written that stage 3-4 is when mesothelioma cancer is found, because it is so often misdiagnosed , as pneumonia or flu. We are almost in shock. This has come about so suddenly. Ray is married and has two grown children and two grandchildren. I thank you for any kind prayers or thought for Ray and his family. There is a lot of work going on in our little town. This corner is being dug up , replacing pipelines. On this corner is our Dairy Queen, CVS drugstore, Casey's gas station, and McDonald's. This is the McDonald's getting the sign erected, after removing the arches from it. I do not know why they are taking the arches from the sign, unless it's a cheap upgrade. This was all going on in one day. Plus here's the Miller pipeline company at the other end of town . They are on the corner near the Jim Dandy restaurant . This where my old high school classmates and I have our monthly brunch. On this corner is the Jim Dandy and their offices are catty corner from the restaurant . The Presbyterian church and another gas station. You can see the church and down from it is the West Street Christian church. Still standing after baptizing me. LOL. What I am getting at, is our town is being dug up every where. Gas lines are being replaced . We will need new streets by the time all this is completed. There are about five digs going on right now. Not much going on around here at our house , other than daily chores. I did cover my plants under a sheet after I put them all together on the porch. This is to be our last day of frost. But I will still wait a week before putting the petunias in pots and containers. Sunday afternoon, my daughter Angie took me to see this play. Moon Over Buffalo. We had a lot of laughs. Everyone in this play did very well. It was a bit too adult for children , in places. Parents were warned in advance... yes, I saw a fourth grader there. This is what's happening here in our yard. The weeping cherry tree is blooming. I love the pretty pink of this tree. Our flowering crabapple is budded out but not bloomed yet. It has a dark blossom . This is the redbud tree. Ours is a bit sparse in appearance, but I do love it. You can see it leans away from the west winds. I just do not want to cut any branches off. I do trim the lower areas. As you can see today is a pretty day, clear skies. I will say, it is chilly out this morning. The temperature is to be 61 this afternoon, that will be nice. Hanging plants at Horton's for 22 dollars. This came with little packet of plant food too. I just went with the same color as the pansies I bought on Tuesday. This was Saturday evening's sunset. Yesterday was very warm , no need for jackets or sweaters. People were wearing shorts. All those pale legs. Where are my sunglasses. LOL. Not for measuring. LOL. I just find sticks in the yard for decorating. Paint them , any color you like. I did a white base coat on all of these. I painted one burgundy and one orange for this container. Three white ones for this big container, that has white pansies and a rabbit. I just think it gives a little character to the containers..to add the sticks , or figurines, or even these little solar lights. I did see where Walmart and Meijers are putting out their plants. But I have not had a chance to look at them. Also this weekend Horton's is getting in there annuls and hanging plants. So I may just go there tomorrow and check them out. I love these beautiful flowering trees. Some call this a magnolia tree. This little house has always looked wonderful with it's two big flowering trees....but this year, I see they have had some damage and lost many branches. So sad. Walking paths in the park. The park crew has mowed and kept our park so clean. This is the park also. Nice green grass, lots of the older trees have been trimmed. This is our willow tree behind the shop/garage. It always greens up first. I love this apricot tree of our neighbors. In line behind it are apple trees, they have not bloomed yet. Years ago, my mom would drive through out our town looking at all the flowering trees, then she would want one of each. LOL. She had the best lilacs in town for many years. Hope it is looking like spring for you. Yes, garden on ... I picked up this cute little tag at Horton's when I got my flowers yesterday. I did get some containers planted. I do need some filler plants. Plus you all know I find some interesting sticks/twigs , and paint them some accent colors , then put them in my containers too. I put the purple pansies with yellow and the orange with burgundy colors. Ted did a great job mowing. Then he checked the oil in the mower, cleaned it up before putting back in the shed. The day was mostly cloudy. The lawn service hasn't been here yet, I am calling them today. After we finished all our chores yesterday. Got showers ,it was time for a reward. A small blizzard at the D.Q. ..well in Ted's case, maybe a medium blizzard. We had a good day. This is what I bought when I was with my daughters and granddaughters at the Peacock Perch. I do not think it's a toy, I think it seems more like a promotional gift. But I fell in love with it and knew I want it to hold flowers. So this morning, I put a paper doily in the back and a pot of pansies. I got myself a flat of pansies/violas and spikes. This afternoon I will be planting in my containers. When I got home with my flowers Ted had mowed the yard. He is checking the oil here. I told him he needs to get that grass off the mower deck. Well the lawn looks good and green. I will have the porch containers done later and that is a good feeling. The first five photos were taken in the Peacock Perch antique store in Rossville, In. I liked these old scales. and the tiny tea set. This store is not lit too well and is small . It was crowded with eleven shoppers while I was there. They specialize in old books and antiques. Lots of glassware. Many colors. I think this was lit with a black light, look at the electric green. Many little figurines. This display is sitting on a very nice antique cabinet. I liked this old toy stove. I really did not check many prices, so I can not tell what it would cost. I did give a look at the prices here...as you can see on the tag. If you are collecting this may be a good price I would not know. Now this picture and the next was taken at J&J Primitives, also in Rossville. The wash board are real. There were ladders, picket fence pieces, crates, and many old things....plus new things. I think this dry sink is authentic. Like the washboards in the store. Nice old bowls too. I did buy one thing. I'll show it later. My daughter , Liz bought some things with chickens on them for her kitchen. She is decorating a bit farm house style now.